Football games for smartphones and tablets go beyond the matches of one on one and offer various types of interactions, such as the ability to create the dream team and manage it. Check out the list of the best football games for Android, iOS and Windows Phone. FIFA 15 is one of the most entertaining football games for smartphones. Although EA Mobile has withdrawn several game modes, only the Ultimate Team and the Manager already render fun for days on end. 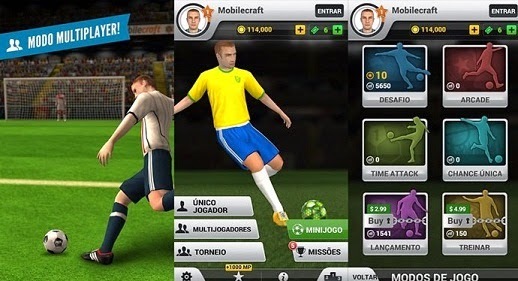 The application stands out for great controls and the ability to play with clubs with uniform and correct names of players, something rare nowadays in football games for mobile phones and tablets. Even if it is a little outdated compared to graphics, Real Football 2013 is still a great football game. Besides being able to create your dream club in this game, you should take care of the players, reform its stadium and more. In addition, the application has great 3D graphics and simple controls. Another football game that appeals enough is Dream League Soccer. Despite not having players with real names or clubs with correct names, the game stands out for its ability to play offline. Also, the app is lightweight and good graphics, including basic and running smartphones. Ideal to play for hours without worrying about battery consumption. Leaving some of the games that try to simulate an entire football, there is the Flick Shoot 2, a great casual game, in which you must collect faults. The goal is to score a lot of goals, but the highlight is the controls that let you do effects on the ball, as curves. And that enables amazing goals. Flick Shoot 2 has many goals and has daily quests that earn points to redeem for new balls. Stickman Soccer is one of the few football games for mobile phones that offers multiple gameplay options. You can view the matches 11 against 11 or only four against four. The graphics are simple, which allows the app to run on multiple devices. The highlight is the amount of championships, as there are many of them. This ensures fun for days on end. Pro Evolution Soccer is no longer available for download in the app stores. Instead of it, Konami released a new game called PES MANAGER. In this application, you will act as coach and owner of a club. You can buy and sell players, and change the strategy in the middle of the game. The app is all in Portuguese and has exclusive mode that lets you take control of matches at certain times. Soccer Spirits is a very different ball game. In addition to belonging to the genera card game and RPG, the game fun to mix sport with the look of the anime. Who loves anime can expect handsome features and remarkable characters. The application brings enough challenge and many characters to unlock and collect. Head Soccer - La Liga is a game featuring cartoon versions of your favorite players. Here, anything goes: you can give kick their opponents, push and more. All with the goal of making the goal. Departures are only between two players, but the fun is guaranteed thanks to humor in cartoon style. The application that contains the list is a fun table football game. At first glance, Soccer Stars seems simple, but he enjoys the competitive online mode. Gradually, you will discover new moves, as hinder the game of his opponent to leave his players over the ball. The fun does not end when the Internet since Soccer Stars also has multiplayer offline.